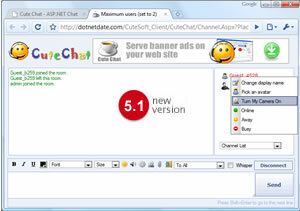 Cute Chat is a full-featured ASP.NET chat program. Nothing else on the market comes even close to it. It includes features such as Moderated chat, high load support, font/color/ customization, emoticons, private messaging, private chat room, profanity filtering, ignoring users, file Transfer, and many more! Try the demo | Purchase | Deployment. Copyright 2005 CuteSoft.Net. All rights reserved.